GRAY — Organizers of the second-annual Gray Blueberry Festival are gearing up for an expanded event on Saturday. Lacy Antonson, chairwoman of the town’s Blueberry Festival Committee, said the group is adding new elements and building off last year’s inaugural event. She hopes to double attendance from last year, when 1,500 people joined the fun. The festival, which runs from 9:30 a.m. to 3 p.m. on Saturday, Aug. 11, at Gray’s Pennell municipal complex, features a long list of activities. Holdovers from last year’s festival include live music, food vendors, arts and crafts, horse-drawn wagon rides, face painting, a climbing wall, a dunk tank and a blueberry pie eating contest. Rachel Lyn Rumson said the way plans have come together “exceeded our wildest dreams.” She and fellow committee member Roger Dery and volunteers Janet Brennan and Karen Fuller, along with Rebecca Archer, an intern in the town planning department, have been busy preparing for the event. Antonson said this year’s additions come with a focus on “experiential activities” that organizers observed at other events, including the Common Ground Fair in Unity. For example, Saturday’s event will feature a “skill share” tent area where festival-goers can learn more about pursuits, such as beekeeping and various outdoor skills. The town is also opening the Newbegin Gym for watercolor painting, kids’ bracelet making and other “do-it-yourself” programs. The workshops will provide an opportunity for people to “learn how to do something new” and “connect with people who have similar interests,” Antonson said. She also hopes the Blueberry Festival will provide “more exposure” for local groups and clubs participating. The 4-H club will be selling blueberry lemonade to benefit its food pantry initiative, the dunk tank will benefit the Gray-New Gloucester High School class of 2020, and the Dry Mills Schoolhouse Committee will hold a sign-making fundraiser to help generate awareness about its efforts to repair the historic building’s floor. As part of efforts to “really showcase our sponsors,” Antonson said a hybrid game that combines corn hole and mini golf will be held on the Pennell complex field. Rather than having teams of two square off head-to-head as in conventional corn hole, multiple corn hole platforms will be arranged like mini golf holes and people will attempt to throw beanbags through them. Many of the holes will have a logo or other identifying feature to recognize festival sponsors. Two other new additions will be educational talks in the Town Council chamber and history tours around the Pennell Building. The Maine Narrow Gauge Railroad is also planning to bring a caboose to display the festival, Antonson said. “We’re excited to really spread the festival out to the field and inside the buildings,” Antonson said. The theme of the festival is “celebrating community connection and culture” and Antonson expects “more things to see and discover” compared to last year. There will be wild blueberries for sale and visitors can learn how to raise blueberry plants. There is no festival admission, but some of the activities – such as workshops and the climbing wall – will cost money, as will food. Gray Town Planner Kathy Tombarelli pointed out that the weather forecast is supposed to be favorable for Saturday, and said the festival could outgrow the Pennell Complex moving forward. “Now it’s just a matter of expanding on it,” Tombarelli said. 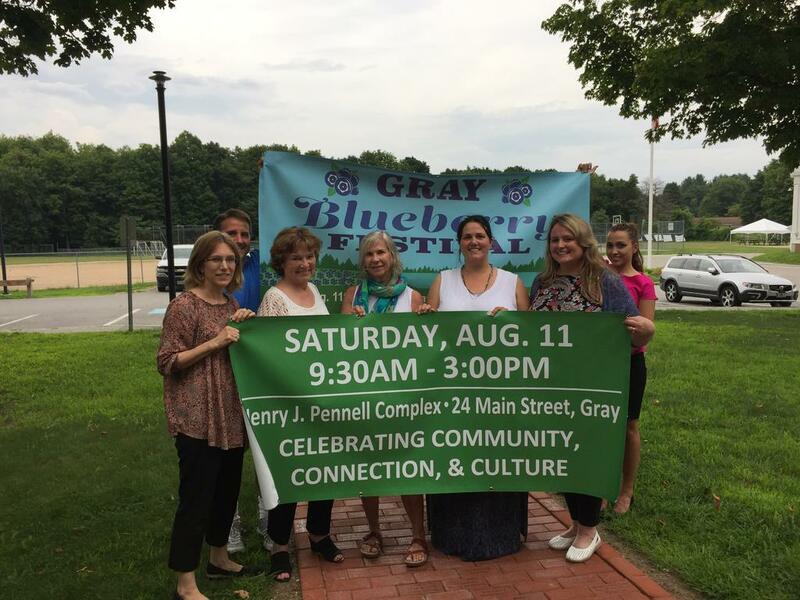 Gray Blueberry Festival Committee members and volunteers are preparing for the Aug. 11 event. From left, Lacy Antonson, Roger Dery, Janet Brennan, Karen Fuller, Rachel Lyn Rumson, Kathy Tombarelli and Rebecca Archer.